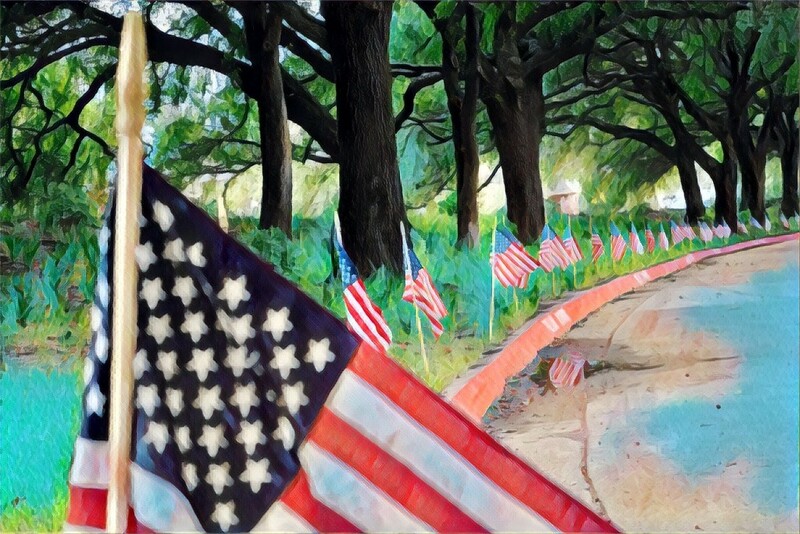 The drive into the country club for my high school ladies luncheon was lined with flags in honor of Veteran’s Day when we were there this past week. Veteran’s Day is today, November 11, all of our businesses will be closed in honor of the holiday tomorrow. Wonderful display for Veteran's Day. Wow - this is a great display. Really love your processing! This is magnificent Lou Ann, fabulous processing! You should enter it for etsooi-103! A sure winner and fav! A wonderful display, Lou Ann. Wonderful collection of flags along the roadside. Great tribute and lovely processing. Oh, and thank you to your husband for serving our country and protecting our freedoms. Very nicely done, Lou Ann! Fav. A wonderful composition and a strong tribute for the day. @henrir @365karly1 @ludwigsdiana @gijsje @pcoulson @lynnz @joansmor @carolmw @happypat @radiogirl @claudiet @olivetreeann @olivetreeann @cindymc @taffy @happysnaps @mittens @bkbinthecity Thank you all for your wonderful comments! You put this on the PP and TP, thank you! The flag in the foreground was so out of focus, I was glad the processing made that not as noticeable.